Plants 30-200 cm. 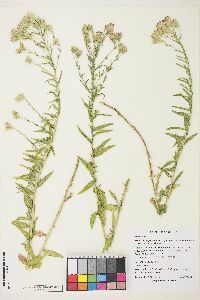 Leaves opposite; petioles 0-10 mm; blades 1- or 3-nerved from bases, lanceolate to lance-linear, 5-90 × 2-15 mm, margins entire or coarsely dentate. Heads in paniculiform or corymbiform arrays. Peduncles 5-25 mm. Involucres 8-15 mm. Phyllaries green to stramineous, sometimes purple-tinged (lengths of outer to 1/2 inner, apices acute to acuminate, not contorted). 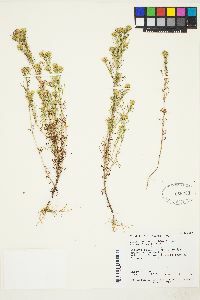 Florets 15-35; corollas pale yellow to pinkish lavender, 4.7-8 mm. Cypselae 2.7-5 mm. 2n = 18. Flowering May-Oct. Open areas, wide range of soils; 200-2300 m; Ark., Colo., Ill., Ind., Iowa, Kans., Mich., Minn., Mo., Mont., Nebr., N.Mex., N.Dak., S.Dak., Tex., Wis.
Usually found in sandy to very sandy soil in dry prairie habitats and infrequently on high, gravelly banks of streams.